The Society contributed to set up two homes for two families having orphans in Lower Dyuke and a third one to a poor family in the Village of Fasayel. 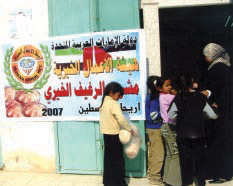 By the end of 2007, the Orphans sponsorships had mounted to over nine hundred as well as sponsoring hundreds of poor kids. These orphans and poor children receive monthly stipends that exceeded 1.5 million shekels last year. Further, the Society distributed financial aids to hundreds of needy families in the Governorate. 1. The Society doubled its efforts during the past year. It distributed thousands of food parcels to the needy families and employees of State Ministries and Departments as well to those getting limited income at public and private sectors alongside the unemployed. The reason being, the hard circumstances, the unjust siege imposed on our people. 2. 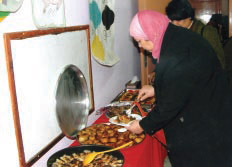 The Society went on to participate with the Arab Development Society in the food basket project. It was agreed that the project should be carried out on the basis of three distributions for three successive years. More than two thousand families benefited from this project. 3. 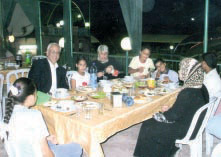 The charitable loaf project: The Society implemented the charitable loaf project sponsored by UAE Charitable Acts Society over 2007.The project cost over hundreds of thousands of shekels with the cooperation of a number of bakeries and local councils. Thousands of families benefited from this project throughout the Governorate of Jericho. 4. 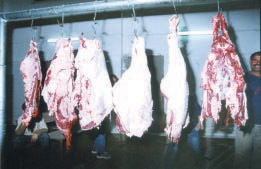 The Society carried out the job of meat distribution of different sorts to over (2500) needy families during the year. 5. The Society distributed clothes and shoes to over a thousand needy families during the year. The Society arranged a number of charitable Collective Iftars for orphans, the needy and the students of Qur’an reciting centers during the Month of Ramadan coordinated with certain institutions and firms on top of which was Jawwal which made possible over ( 200 ) Iftars for orphans at the Banana Land Park. The Company pleased these orphans, photographed them and granted them some presents. The Society distributed Adahi to the families that led sheltered lives throughout the Governorate. This mounted over (5,000) portions. 1. Presenting lectures and religious preaches pertaining to feminine topics once per week. 2. Medical lectures and scientific seminars as well as health care days with the co operation of specialized physicians, including: Dr.Muhannad Da’na specialized in infants diseases, Dr.Jamal Salsa’specialized in dermatosis and skin diseases and Dr. Hazem Joulani specialized in alternative medicine and cupping as well as meetings between those suffering from Cancer and specialists of this illness under the supervision of the Friends of the Diseased in Jerusalem. 3. Enrichment courses for students of different levels in various subjects. 4. Qur’an recital and memorization courses for both the young and the old. 5. Several cultural recreational Ramadan evenings during the Month of Ramadan. 6. Tours to the lbrahim Mosque and other historic and ancient sites across the country alongside tours to Al-Aqsa Mosque during the Month of Ramadan. 7. 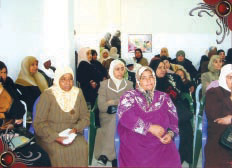 Specialty courses in illiteracy,management,human development, computing and psyco- health for the sake of mothers under the Love Bridge Project as well as First Aid training sponsored by the Palestinian Red Crescent Society. 8. “ How to be a Female Preacher”course with the co-operation of Al-Fatwa and Islamic Research department. Four groups graduated in this field. Dr Nasser Sa’ afin Deputy Dean ESF Ramallah. The topic of his lecture was “ Worries in Exams”. Dr Eisa Wadi of Tira ESF who lectured on “ Success Bases “. Dr Munzer Nasrallah of the Ministry of Education and Higher Education who gave a lecture on: “ Instructions to Post-Tawjihi Students”. 10. On the occasion of International Day to fight Drugs participated Director of the Good Friend Society Majed Allush accompanied by Afaf Rabee ’and the society of the Good Friend to Rehabilitate Drug Addicts in Jerusalem. They put an annual plan to fight drugs on the basis of weekly lectures for the Governorate of Jericho students. 11. The Centre took part in an educational day in Aqabat Jaber Camp with the cooperation of SOS alongside another workshop organized by the Red Crescent and SOS. 12. The Centre participated in educational and recreational activities with the cooperation of Women Societies in the Governorate. 13. The Centre took part in an OU workshop attended by OU students and a number of institutions in Jericho and Ramallah to discuss the role of institutions in community service. 14. The Centre paid official visits to the Governorate of Jericho and the Jordan Valley and to the Bethlehem Amal ( Hope )Center. Participated in the visit a number of ladies supporting the Society. 15. We also met female Quran recitals at Anata Center- Jerusalem. 16. The Centre is to hold qualifying courses for widows and needy women including: Make up, sewing, embroidery, flower design, ceramics and secreterial study and so forth. 17. The Charitable Dish: The centre has repeated this activity a number of times over the year to finance its activities in various areas. 18. The Centre has held physical fitness courses supervised by specialist women. 19. Collective Iftar: The Centre organized a charitable Iftar for women in the Month of Ramadan to raise funds for orphans. This proved success and pleasure. The Society carried on distributing collecting-boxes to the stores, institutions and banks of Jericho to collect funds to finance its activities. The merchants and managers favored the idea and that proved success.